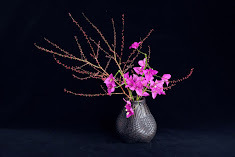 I have been talking about what Ikebana is from various view points. 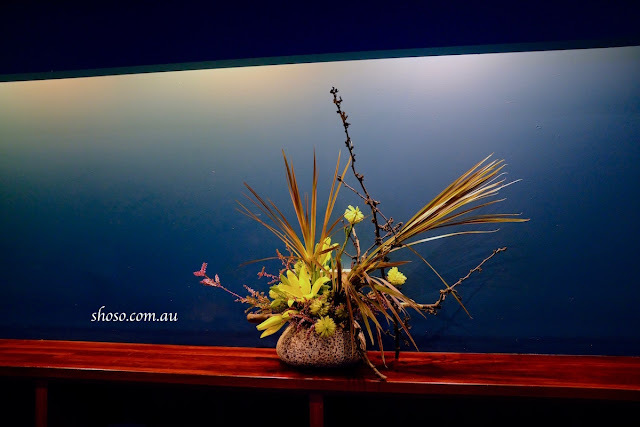 A well supported definition of Ikebana is that it is a spiritual training. However, what it means is rather complicated. Zen philosophy may be helpful to understand Ikebana as a spiritual training, but as I mentioned in the previous issues, I have many questions about such an approach. Zen philosophy alone cannot explain all aspects of Ikebana nor Japans culture. As my previous essays suggest, thinking about Ikebana is closely related to thinking about Japanese culture. Also, studying history of Ikebana is actually studying about Japanese history. The rise of samurai class as political power affected Ikebana style and economical power of merchant class in Edo period also affected Ikebana. Ikebana as a part of the Japanese culture changes in accordance with it society. Let’s now consider Ikebana as spiritual training further. First of all, are we practicing Ikebana as a spiritual training today? If so, spiritual aspects should be included in Ikebana teaching, and we should expect Ikebana teachers to be highly virtuous. In my view, that is not the case, although, off course, there are so many variables. The point is that there is a reason for this. Actually the traditional notion of Ikebana as a spiritual training was strongly denied in the early 20th century. It was Mirei Shigemori who provoked a notion that Ikebana has nothing to do with a spiritual training. He influenced many Ikebana artists including head masters of Sogetsu school and Ohara school, the two of the three major Ikebana schools. As I mentioned before, Shigemori is one the greatest Japanese garden designers in 20th century. In fact, his garden designs inspired me so much that I decided to study about Japanese gardens and got a qualification as a garden designer. I’ll write a bit more about Shigemori in the next issue and then I’ll write about my thoughts on Ikebana as a spiritual training. In June I talked about Ikebana at NGV, and Dr Kobayashi, president of International Society of Ikebana Studies will also talk about Ikebana at the University of Melbourne on 18 August, 2017. Details will be on my website. This is a work I made for Hanabishi restaurant in city. Working to create regular displays has been a good training for me for many years.